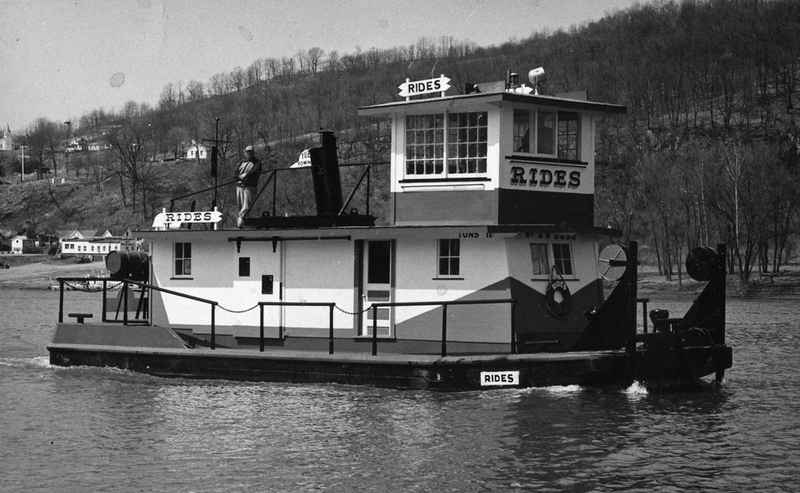 RIDES was built by YATES MARINE CONSTRUCTION CO. (Yates, Jack and Pluckebaum, Arthur) in Wheeling, (Wheeling Island) West Virginia in 1955 as a steel-hulled single prop Diesel ferry towboat with a 180 hp Cummins diesel engine for the Sistersville Ferry Co. which operated its ferry service from Sistersville, West Virginia to Fly, Ohio. In 1957, she was in ferry service operated by Capt. Joseph Witten, and from 1964, Capt. Gilbert Harmon of Sardis, Ohio operated her. RIDES was the third boat built by Yates in Wheeling, and RIDES was still listed in the 1975 INLAND RIVER RECORD book. Source: Way, Frederick, Jr., INLAND RIVER RECORD 1956 and 1975 Sewickley, Pa.
YATES MARINE CONSTRUCTION CO. (Yates, Thomas ‘Jack’ and Pluckebaum, Arthur) began building diesel towboats, ferry flats and barges in Wheeling, (Wheeling Island) West Virginia in 1953. Yates and Pluckebaum had worked in the Louisville, Kentucky, Jeffersonville, Indiana boat yards, and in 1953, they decided to go out on their own. That year, they came to Wheeling where they established a boat yard on Wheeling Island. 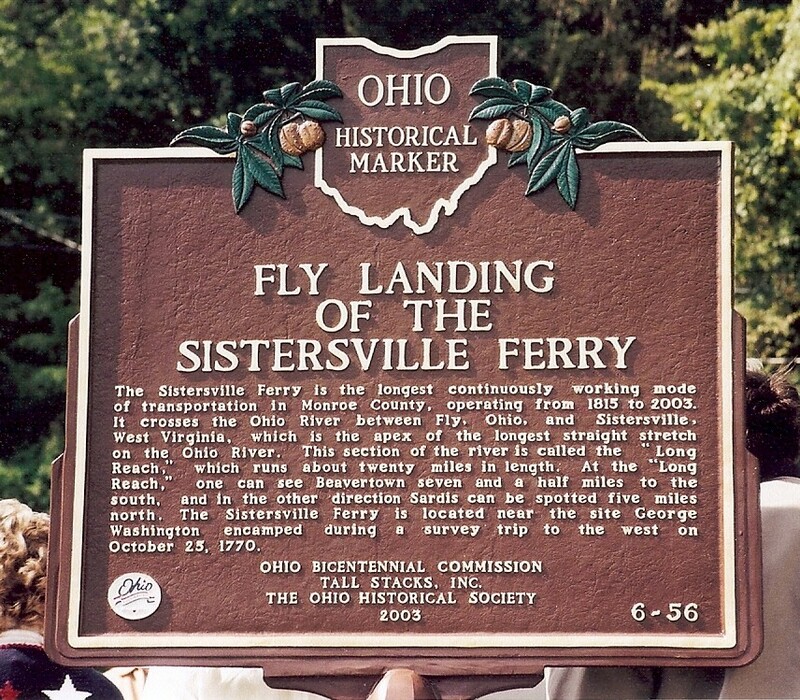 The Ohio Historical Highway Marker at the Fly Landing tells us that the Sistersville Ferry was in operation in 1815, other local histories tell us the Sistersville1 ferry was established in 1817. This we know for sure, January 28, 1818 the General Assembly of Virginia passed an act granting a ferry franchise crossing the Ohio River at Sistersville, Virginia to John McCoy. The State of Virginia set the fares; the fare to cross the river was six pence for a man and the same for a horse. We don’t know what type of ferryboat first served Sistersville, however the not too shallow Ohio River ran rather swift at Sistersville, and the manpower needed to push-pole a barge across the river would not have been workable.2 McCoy probably used the type ferryboat in use at that time in Wheeling, a two-horse powered treadmill ferryboat. Steam-powered ferryboats became available in the 1840s but some histories have the Sistersville Ferry running horse-powered treadmill ferrys into the late 1880s. In 1886, they purchased the 1884 built steam-powered Orion, and a new steam-powered ferryboat, the W.C. Pusey in 1889. The “Sistersville Ferry Company” (in name) was formed in 1894 when John McCoy’s descendants, Frank D., A.S. McCoy, and Elizabeth W. Talbott bought the ferry franchise from the remaining McCoy family members. In 1907, the Orion was converted into the steam-powered ferryboat Daniel, which they sold in 1917. After selling the Daniel, the fleet went from steam-powered ferryboats to gasoline-powered ferryboats. These boats were built at Clarington, Ohio, those being the 1917 gasoline-powered stern-wheel Dora T. that ran into 1925, and the 1925 gasoline-powered Kiwanis in operation into 1956. The Sistersville Ferry Company became a stock holding company and issued shares in 1920. In 1937, stockholder Everett Tuel bought up shares then owned by Elizabeth Talbott’s descendants gaining control of the company, which he operated as the “Tuel Fleet”. The balance of shares remained with the McCoy family. Tuel went to diesel-power when he purchased the 1938 Elinor D. and the 1939 John F. III. They would serve the Sistersville Ferry service to 1955. Tuel sold his interest to Joe Witten in 1955 and Witten bought out the last of the McCoy interests in 1960. The McCoy family had owned or been involved in the Sistersville ferry for over one hundred-forty years. 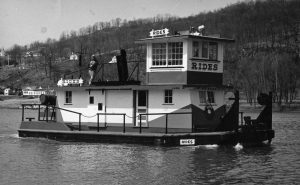 Joe Witten had the Rides; a new diesel powered ferry-towboat built for him by Yates Marine Construction Co. in Wheeling, W. Va. in 1955, and added the Sham ferryboat in 1958. Capt. Gilbert B. “Dib” Harmon3 bought the ferry service in 1964 and used the Rides into 1977 when he shut the service down. In 1980, the city of Sistersville, West Virginia purchased the ferry service. They bought the 1952-built Judge Hickman stern-wheel ferry-towboat, and in 1991 renamed it the City of Sistersville. 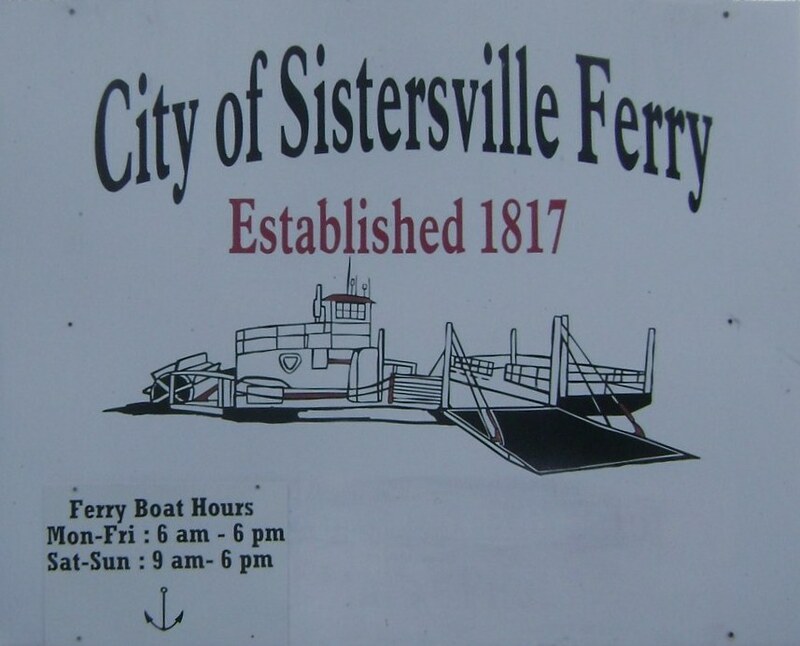 In 1999, a new ferry-towboat, the diesel-powered City of Sistersville II replaced the old City of Sistersville. 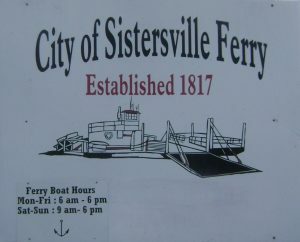 The Sistersville Ferry, West Virginia’s oldest ferry franchise is operated daily using the City of Sistersville II, and the Capt. G.B. Harmon barge, which holds as many as eight cars (barges have names too). 2 The use of a cable stretched across the main channel of the Ohio River that would impede navigation was never allowed by the state of Virginia. This negated the use of a lea-board or Current Ferry. 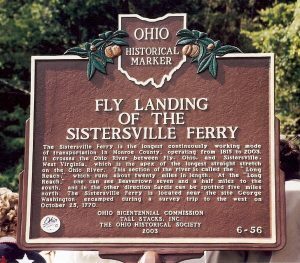 The Sistersville Ferry is the longest continuously working mode of transportation in Monroe County, operating from 1815 to 2003. It crosses the Ohio River between Fly, Ohio and Sistersville, West Virginia, which is the apex of the longest straight stretch on the Ohio River. This section of the river is called the “Long Reach”, which runs about twenty miles in length. At the “Long Reach”, one can see Beavertown seven and a half miles to the south and in the other direction Sardis can be spotted five miles north. The Sistersville Ferry is located near the site George Washington encamped during a survey trip to the west on October 25, 1770.